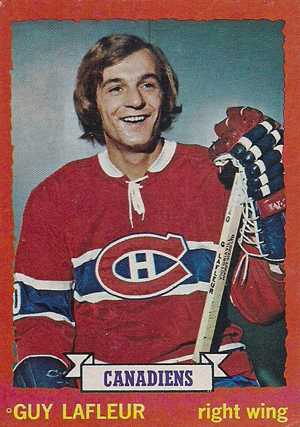 For the second straight year, 1973-74 Topps Hockey increased the number of cards in its hockey set. At 198 cards in all, it was the largest hockey set yet issued for the Topps brand. Card fronts feature a player picture, which is either posed or taken during a game. The edges of the picture seem to be scalloped along the border, which is one of four different colors: red, yellow, blue or green. A white banner at the bottom of the photo gives the name of the player's team. Their name and position also appear at the bottom, inside the border area. The backs are laid out horizontally, with the player's name inside a black strip that runs near the top. The card number appears in the top-left, and his position and team name appear above the strip. A hockey stick icon separates the player's vital stats from a biography and a single line of statistics from the previous season runs along the bottom. A cartoon about the player is featured in a box to the right. The first six cards in 1973-74 Topps Hockey feature league leaders in different statistical categories. The final eight cards recap the playoffs and Stanley Cup champions. All-Star players are noted on their base cards by a different design that features a shield. Team picture cards run alphabetically by city name from card 92 through 107. There is also a checklist card included in the set. Due to the way the printing sheet was laid out, 66 cards in the set are double-printed. Ken Dryden is the most significant player who does not also appear in that year's O-Pee-Chee set. Notable rookies in 1973-74 Topps Hockey include Bill Barber, Billy Smith and Dave Schultz. 1973 74 TOPPS NHL HOCKEY CARD #2 PHIL ESPOSITO BOBBY CLARKE LEADERS EXNM SHARP! !